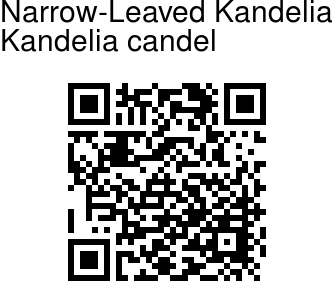 Narrow-Leaved Kandelia is a small tree up to 7 m tall. Buttresses and pneumatophores are absent. Leaves are opposite, blades shiny, mid-green, narrowly oblong, elliptic or drop-shaped-oblong. Stipules are flattened but slightly twisted at the branch tips. Flowers are whitish, with numerous protruding stamens. Seeds are viviparous, seedling hypocotyl narrowly cylindrical or club-shaped, up to 40 cm long at maturity, capped by the persistent sepals whose tips bend backwards to the fruit stalk. 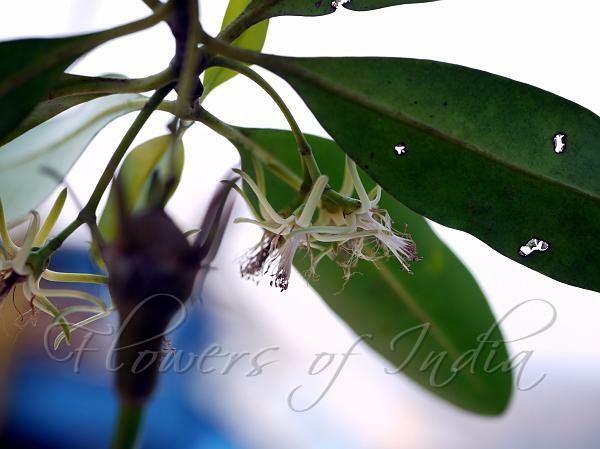 Narrow-Leaved Kandelia is used as firewood, making enclosures and stakes and source of tannin. Identification credit: Shrikant Ingalhalikar Photographed on banks of river Vashishti, Chiplun, Maharashtra.